1. the thigh bone, extending from the pelvis to the knee; the longest and strongest bone in the body. Its proximal end articulates with the acetabulum, a cup-like cavity in the pelvic girdle. 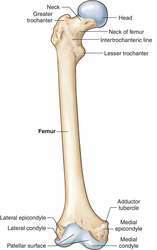 The greater and lesser trochanters are the two processes (prominences) at the proximal end of the femur. See anatomic Table of Bones in the Appendices. (fē'mŭr, fem'ŏ-ris, -ă), [TA] Avoid the mispronunciation femor'a of the plural of this word. 2. 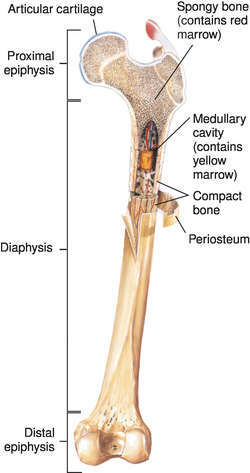 The long bone of the thigh, articulating with the hip bone proximally and the tibia and patella distally. 1. the bone that extends from the pelvis to the knee, being the longest and largest bone in the body; its head articulates with the acetabulum of the hip bone, and distally, the femur, along with the patella and tibia, forms the knee joint. a. A bone of the leg situated between the pelvis and knee in humans. It is the largest and strongest bone in the body. b. A functionally similar bone in the leg or hind limb of other vertebrates. Also called thighbone. 2. The thick, most muscular segment of the insect leg, situated between the trochanter and the tibia. the thigh bone, which extends from the pelvis to the knee. 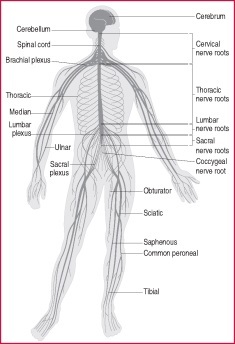 It is largely cylindric and is the longest and strongest bone in the body. It has a large round head that fits the acetabulum of the hip, and it displays a large neck and several prominences and ridges for muscle attachments. In an erect posture it inclines medially, drawing the knee joint near the line of gravity of the body. The thigh bone. It extends from the hip to the knee and is the longest and strongest bone in the skeleton. The thigh bone. The upper end of the femur forms a ball and socket joint with the side of the pelvis. The lower end widens to provide the upper bearing surface of the knee joint. the thigh bone of TETRAPODS. the insect leg joint between the trochanter (2nd segment) and tibia (4th segment). the thigh bone - the longest and strongest in the body. Articulates proximally with the pelvis at the hip and distally with the tibia at the knee. Fractures of the femur can result in significant blood loss and clinical shock. 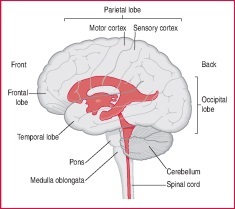 See Figure 1, Figure 2. 1. the thigh bone, extending from the pelvis to the stifle. 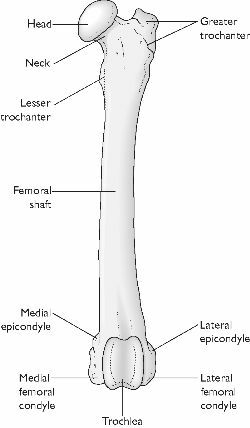 The greater and lesser trochanters are the two processes (prominences) at the proximal end of the femur.